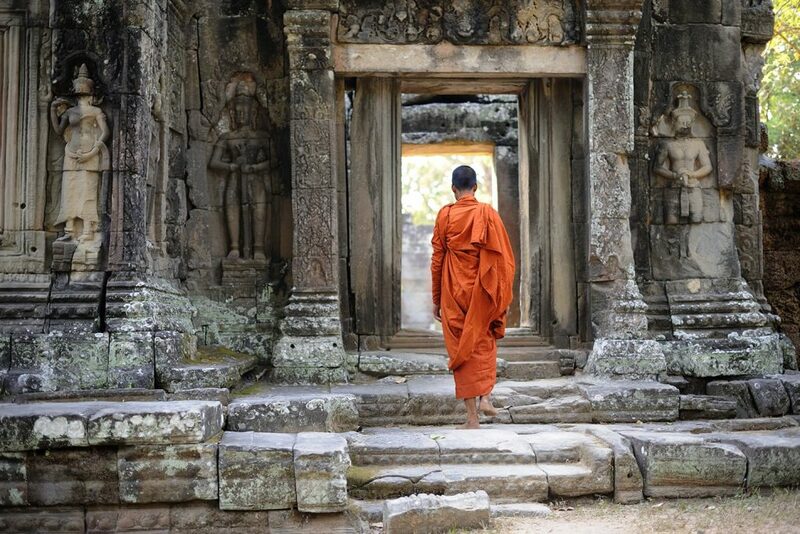 One of the most treasured religious sites in the world, Angkor Wat and the temples of Angkor are a true world wonder. An essential part of any Cambodia itinerary, Angkor Wat captivates visitors with its jaw-dropping beauty and incredibly preserved cultural heritage. 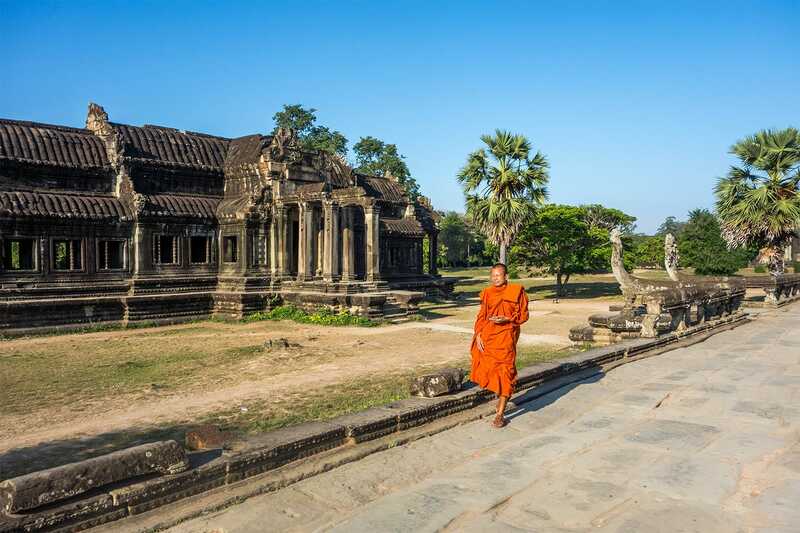 With far more to see than visitors expect, the challenge with a journey to Angkor Wat is working out how best to experience it all. It’s entirely possible to spend a complete day, from sunrise to sunset, exploring the Angkor temple complex, and still not come close to running out of temples to see. With so many possibilities, it’s best to go prepared, knowing exactly what to see and how to get around. Following our ultimate guide to Angkor Wat you’ll have all the information at your fingertips to see the best of Angkor Wat in a day along with everything else required to make your trip a complete success. So you have more of an idea of what makes Angkor Wat such an important and spellbinding place to visit, it helps to know a little about its history. 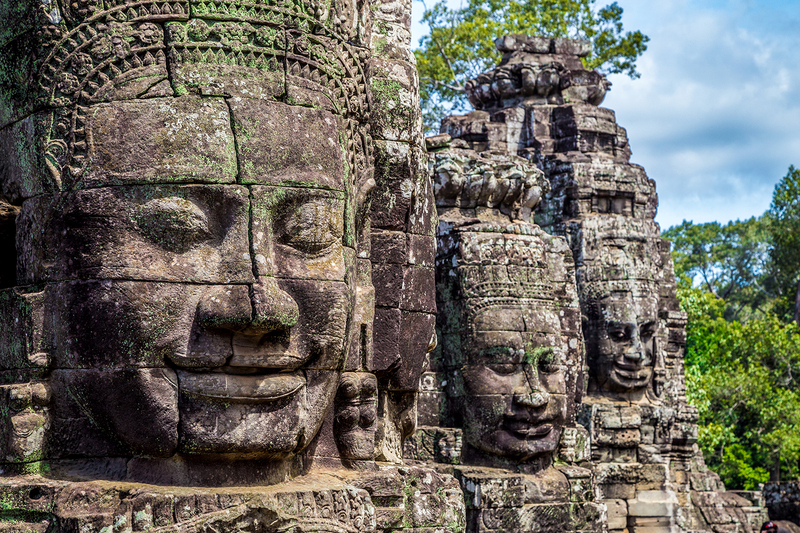 By learning a little about Angkor and the heritage of its temples and cities, the sights you see while there will be even more impressive and memorable. Located in northwestern Cambodia, Angkor Wat is located just outside the city of Siem Reap in the ancient city of Angkor, once known as Yasodharapura. The city of Angkor was founded around the start of the 10th century and each of the temples of Angkor were built during different periods. Angkor Wat, specifically, was built in the first half of the 12th century, and many of the other famous Angkor temples were built afterwards. Angkor was built by the kings of the Khmer Empire, whose empire spread right across southeast Asia. Covering modern day Cambodia, Laos, Thailand, and parts of Vietnam, the empire reigned from the 9th to 15th centuries. The city of Angkor was first built by King Yasovarman I, while Angkor Wat itself was built by King Suryavarman II. Many of the other temples of Angkor were built by his successor, King Jayavarman VII, who had the Bayon temple built inside the new capital, Angkor Thom. Situated outside the city of Siem Reap in Cambodia’s northwest, Angkor Wat is an established stop on the tourist trail through Southeast Asia. Since it’s also Cambodia’s number one destination, it’s one of the easiest places to get to in the country. Whether you’re trying to work out how to get from Bangkok to Angkor Wat or from somewhere else closer in Cambodia, we’ve got you covered. The most direct way to reach Siem Reap and Angkor Wat is through Siem Reap International Airport outside the city. Most full service and budget Asian airlines have at least a few connections to Siem Reap from a lot of major Asian cities. You can also take domestic flights from Phnom Penh and Sihanoukville. The other option you have for traveling to Angkor Wat is to go by land, which in Cambodia means either traveling by bus or by private transfer. Essentially a taxi service, the private transfer is a car, van, or minibus, which brings you to Angkor Wat from Phnom Penh or Bangkok. These transfers are the most expensive option but are also likely to be the most comfortable and private. The more affordable way to go though is by taking a bus, whether from Bangkok, Phnom Penh, or somewhere smaller like Battambang. A key factor when planning a trip to Angkor Wat, or any trip really, is working out how long you need to visit. 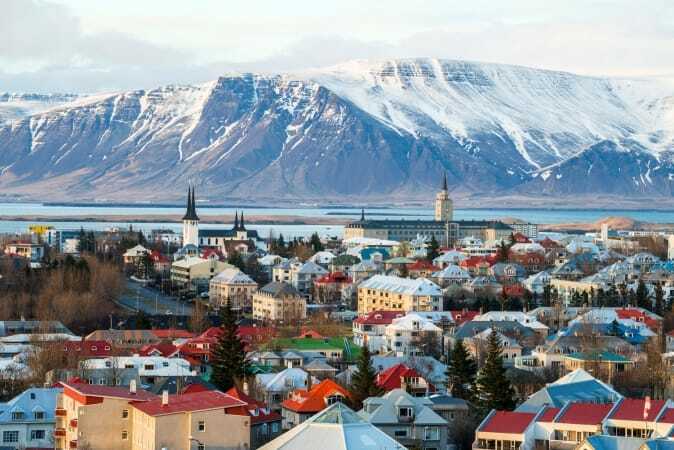 There’s nothing worse than realizing you booked too long or not long enough in a destination. At Angkor Wat, this can be a tough question as it depends on how you choose to get around and how many of the hundreds of temples you want to see. It is possible to see quite a lot of the Angkor complex in a single day, including the best known highlights. But two days is even better as you can vary how you get around, venture to further out temples, or take things easy. Unless you plan on seeing some of Siem Reap’s other nearby attractions like Tonle Sap lake or ticking off every single temple then three days is probably not necessary. During the day, most temples are open daily from 7.30am to 5.30pm, so you can fit quite a lot of sightseeing in with your one day. The exceptions to these hours are Angkor Wat and Srah Srang that open at 5.30am for sunrise, and Phnom Bakheng and Pre Rip which are open from 5am to 7pm for sunrise and sunset. The ticket office however, is open from 4.30am to 5.30pm. Visiting Angkor Wat, there are several different types of the Angkor Pass that you can buy. The one day pass costs US$37, the three day pass US$62 and the seven day pass US$72. Both the three day and seven day pass don’t need to be used on consecutive days and are valid for one week and one month respectively. When planning to visit Angkor Wat in one day, one of the biggest decisions you’ll have to make is how you want to get around on that day. 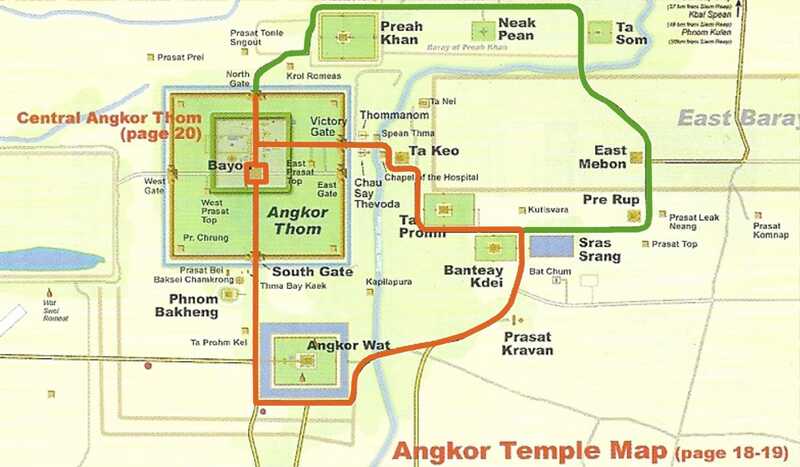 Angkor is huge and walking from one temple to the next really isn’t feasible. You’ll do plenty of walking at each of the temples, not to mention you’ll be climbing countless stairs. With that in mind, the three ways to get around Angkor are by tour van, tutkuk, or bicycle. Unfortunately, foreigners are not allowed to ride a motorcycle/scooter inside the Angkor complex. As the most comfortable means of seeing Angkor, sightseeing with a tour van is also the most expensive option. Sitting inside an air-conditioned van, you’ll comfortably get from Siem Reap to Angkor and then go from one temple to the next. As you go around, you’ll have a tour guide explaining the history behind each of the places you visit. Costs will vary depending on what is included and whether you choose a private or shared tour. Recommendation: If you want to visit Angkor Wat on a tour instead of doing it on your own, we can highly recommend this full-day sunrise tour. It’s great value for money, the tour guides are super knowledgeable and friendly, and you get to see all of the best temples in Angkor Wat. 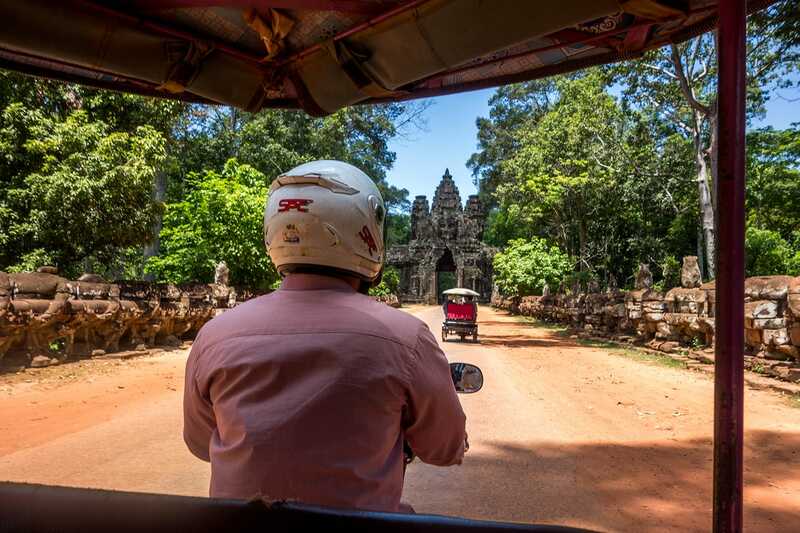 If transport is all you’re after then hiring a tuk tuk for the day is a great way to see Angkor. The driver can take you from one temple to the next and wait around while you go see the temples. What’s more, you have the freedom to customize your visit to suit you as you go along. Sightseeing with a tuk tuk offers a great balance between cost and convenience, and hiring one for the day should cost around $15-20 depending on your negotiation skills. If you prefer to be active as you sightsee, then you might want to consider renting a bicycle for the day. For a few dollars you can pedal your way over to Angkor from Siem Reap and go about as you please along the flat roads. Although the cheapest option, it’s also the slowest and can be really tough when the weather is hot. Keep in mind too that cycling through traffic in Siem Reap after sunset is not advisable. As a tropical Southeast Asian destination, Angkor doesn’t experience four seasons but more of a pattern of dry and wet seasons. That being said, the temperature does vary throughout the area, going from mild and pleasant to hot and humid. Ultimately, the best time to visit Angkor is when it is both cool and dry which means the months of November through March. Naturally, this is also high season for tourism in Angkor Wat and Siem Reap so plan accordingly. Outside of those months, you may have to deal with the heat, monsoon rains, or both. Angkor is at its hottest from April to June and sightseeing in the early afternoon can be draining, especially by bicycle. The heavy rains from May through October shift from sudden downpours to more constant rain as the months go on, which is also not the best conditions for sightseeing, especially on minor dirt roads. Coming out of peak season has its advantages though, from fewer tourists at the temples to more affordable room rates in Siem Reap. There’s really only one option when it comes to looking for places to stay near Angkor Wat and that’s the nearby city of Siem Reap. This resort town is basically the gateway to Angkor Wat and has proceeded to grow and grow as more and more tourists come to visit this wonder of the world. With the temples of Angkor only 6 kilometers away from the city, you won’t have any problem finding a hostel or hotel in Siem Reap near Angkor Wat. As for where to stay in Siem Reap, closer to the Old Market in the city center is better. There’s no problem staying across the river, but you’ll likely want to be walking distance from the central sights and places like Pub Street and the Night Market. J7 Hotel: A 5-star hotel with huge rooms that have been gorgeously appointed in wood. Besides excellent service, guests can expect complimentary breakfast and a private balcony area. While all guests have access to the outdoor swimming pool, some rooms even have private outdoor jacuzzis. Check prices and availability here. Damrei Residence & Spa: It’s hard to find better value for money than at this surprisingly affordable 5-star hotel. While there is a swimming pool and on-site bar and restaurant, the beautiful and spacious rooms, as well as the staff and breakfast really make the stay here a great one. Check prices and availability here. Onederz Siem Reap: Just a short walk from Pub Street and the center of town, staying at this hostel you’ll be able to enjoy the service from the friendly staff, and the clean, comfortable rooms. Not to mention the awesome rooftop pool where you can watch the sunset from. Check prices and availability here. For more accommodation options near Angkor Wat check out Booking.com. They continuously offer the best rates and their custom service is on point. 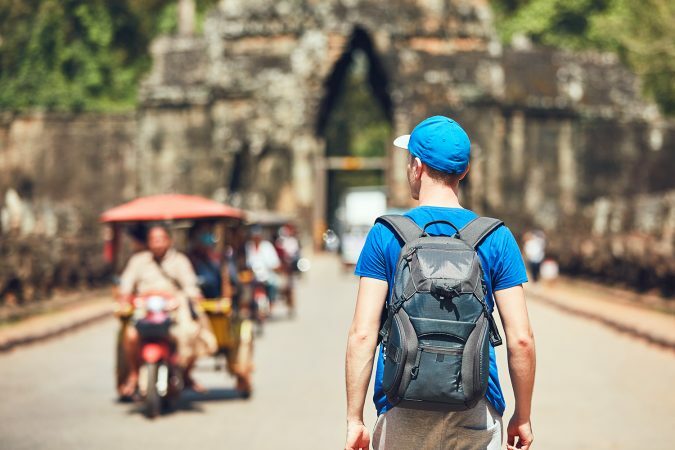 Since you’re going to be out all day exploring Angkor Wat, you’re going to want to make sure you pack everything you might need for the day. For starters, you’re going to be doing a fair bit of walking and maybe cycling, so be sure to pack good shoes for being active. Regardless of how hot it is, bring plenty of water so you don’t have to keep finding places that sell water. As you’re going to be outdoors, proper sun protection in the form of a hat and sunscreen is crucial. And while there is no malaria at Angkor Wat, you should still bring mosquito repellent to help prevent against other diseases that mosquitoes spread like dengue fever. Oh and don’t forget your camera! When sightseeing around the Angkor Wat Complex, tourists usually follow one of two routes around the park, the small circuit (red) and the grand circuit (green). While both circuits take in highlights like Angkor Wat, Ta Prohm and the Bayon, the grand circuit heads further east and north. 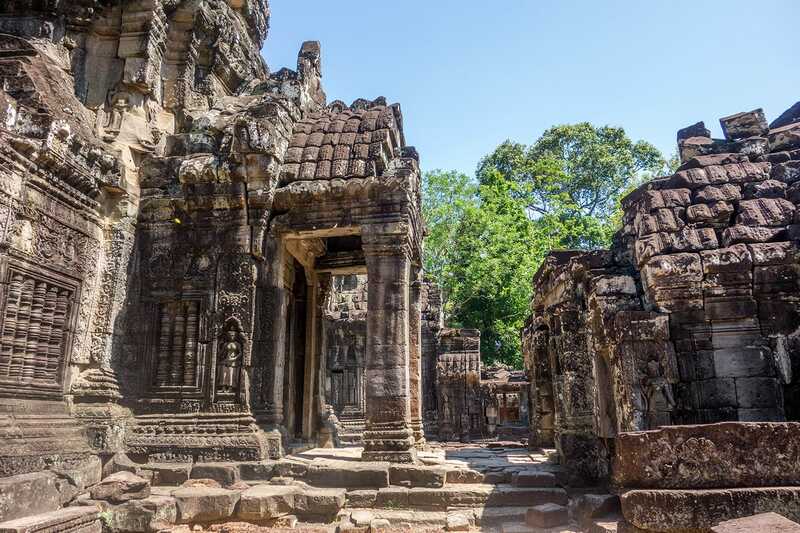 This 26 kilometer circuit takes in several other temples, most notably Preah Khan. Our Angkor Wat itinerary below includes all of the small circuit temples and two temples of the grand circuit. After all of these tips for visiting Angkor Wat, we still haven’t gotten to the most important, your itinerary for the day. 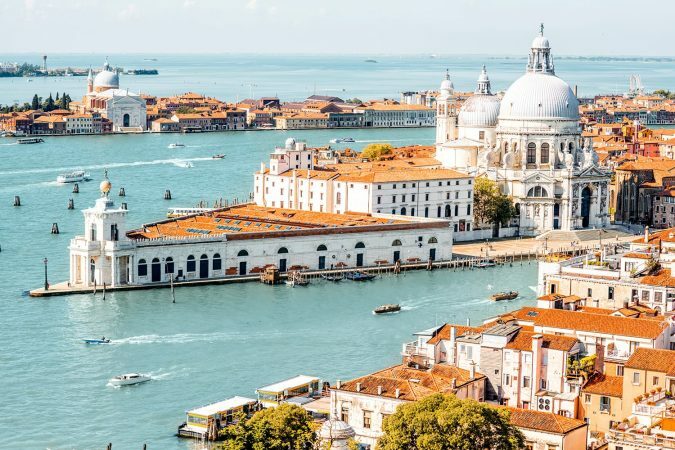 With this guide, we’ve included all the best temples to visit and ordered them so you can easily get from one to the next, and see each one at the best possible time of day. 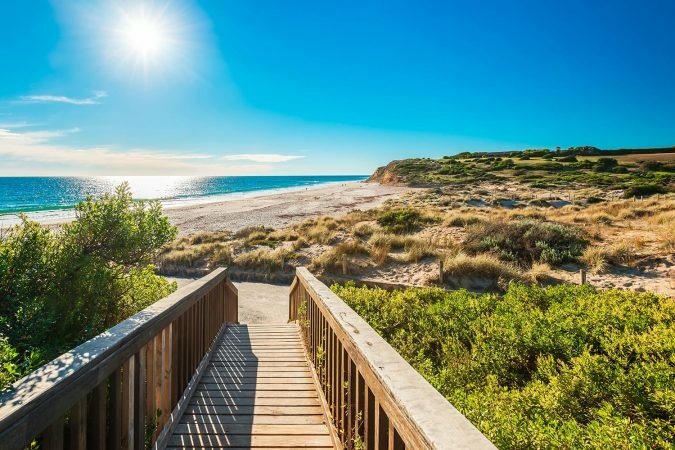 Whether it’s so that you catch the sunrise and sunset at the right spot or go when places are at their quietest, this is the itinerary you want to follow. There’s really no other place to start your day than at the temple of Angkor Wat itself. Arriving before sunrise, you’ll want to head for the reflecting ponds that lie west of the temple. Ideally you want to be at the northwestern edge of the reflecting pond so that you get the ideal vantage point to watch the sun slowly creep over the temple. Starting in sheer darkness, Angkor Wat’s form will slowly start to take shape, each of its five sanctuary towers clearly visible. Expect a fairly large crowd there so if you want to get setup with a camera and tripod, arrive when the gates open at 5am. Once the sun has risen and you’re happy with your photos, it’s time to actually go see Angkor Wat up close. Following the long sandstone causeway, you’ll veer off into one of the side entrances into the heart of the temple. Inside the walls, you’re taken up a series of terraces each with a gallery around it. Inside these galleries you’ll find large, ornate carvings and bas reliefs that tell stories from Hindu mythology. At the top you’ll find a contemplative terrace with four galleries that lead into the main tower of the temple with a shrine to Buddha at the very center. The most famous of the temples after Angkor Wat, Ta Prohm is the place that many people picture when they think of Angkor. Whether you know it as the “Tomb Raider temple” or the “temple where the trees grow out of the rock”, Ta Prohm is far more impressive than you can imagine simply from looking at photos or watching movies. 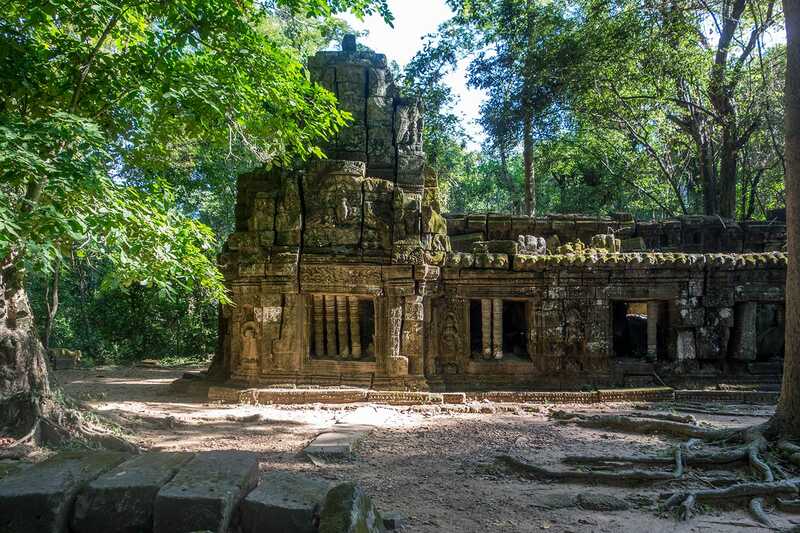 Upon arriving, you’ll first need to trek through quite a bit of jungle just to reach the outer moat of this small temple which was once a monastery and university. It’s easy to see how the temple could have been lost over the centuries as you venture deeper into the jungle. Once you enter Ta Prohm you’ll see the way trees and plants, left in place after the temple’s re-discovery, have reclaimed the temple ruins. It’s amazing to see just how much of the details of the temple have survived to this day. With a wandering path that takes you through different passages and into outer courtyards, there’s much to take in, not only the roots of a tree sprawled around a doorway. If you’re going to linger at any temple throughout the day, it’s likely to be Ta Prohm. 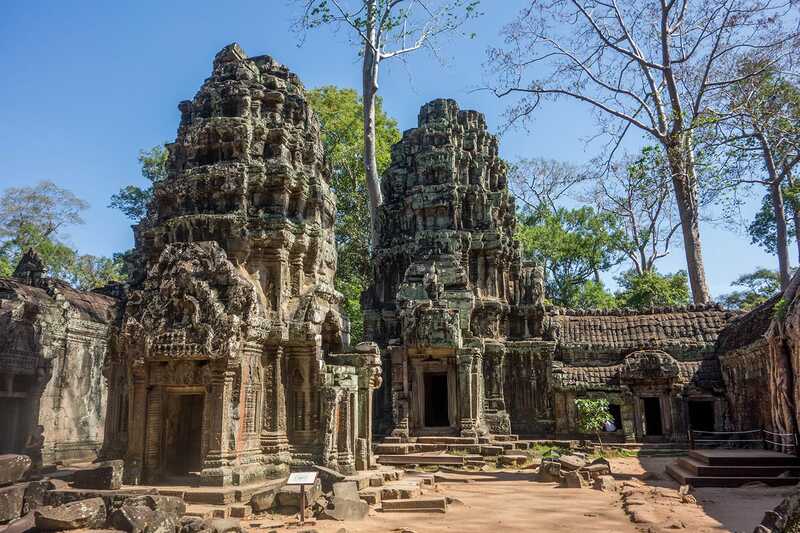 Not far from Ta Prohm, you’ll find Banteay Kdei, one of the unrestored temples of Angkor. Once a Buddhist monastery and temple, Banteay Kdei is similar in many ways to Ta Prohm, though much quieter. Visit and you can delve into its maze of chambers and get a sense of what other temples of Angkor must have looked like before the restoration efforts over the last decades. 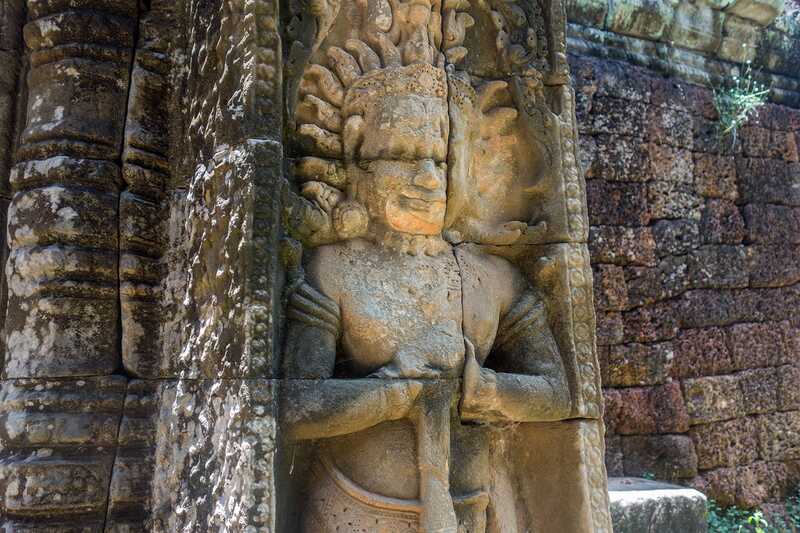 Much of Banteay Kdei’s charm comes from its disheveled, overgrown character. 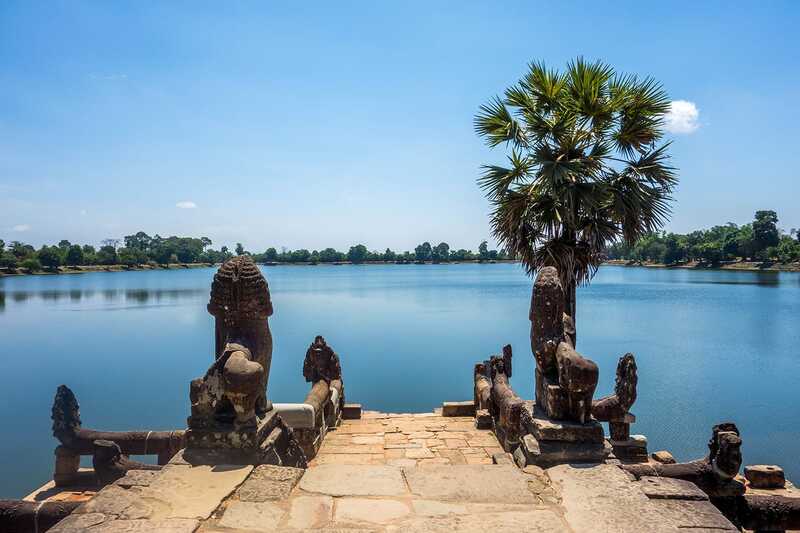 Just across from Banteay Kdei you’ll find the Srah Srang reservoir. While only a water reservoir today, it is likely that there was also some form of temple here back when it was built in the 12th century. 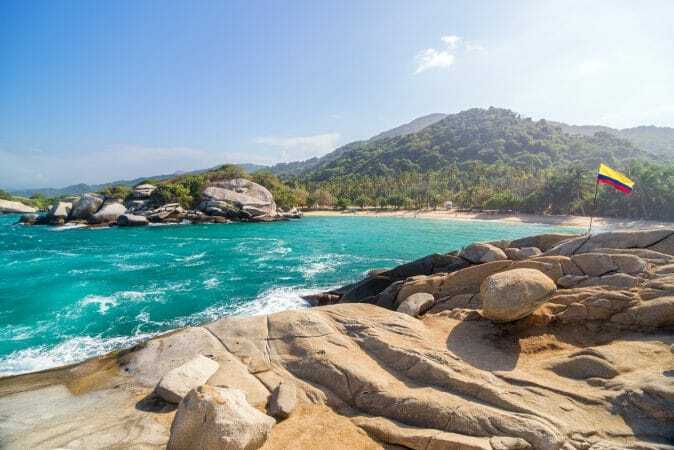 With a small stone platform terrace and trails around the sides, Srah Srang is a peaceful break from climbing temples and also quite a popular sunrise spot. The platform still has several sculptures that remain, include a pair of naga serpents overlooking a pair of lions on the stairs leading into the water. Off to the north and a little removed from all the bustle of Angkor’s other temples, Preah Khan is known for its tranquil nature. Unlike many of the Angkor temples seen so far, Preah Khan has a flat layout to it. Entering from the east, you have a huge lake behind you as you cross the moat, while the western entrance is down a more secluded leafy path. Past the mossy outer walls of the temple, you’ll go down another path through the jungle until you reach the temple proper. Inside, Preah Khan is like a maze of ancient corridors with plenty of dead ends. Nowhere near as restored as other temples, you get a sense of how time has affected the ruins. Even still, the details of the carvings and reliefs, plus the red hue of worn paint is quite incredible. 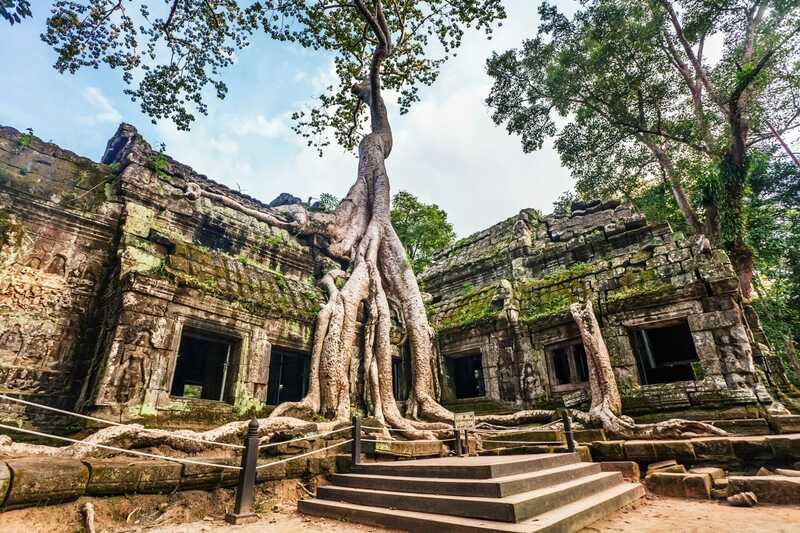 Like Ta Prohm, you’ll find the occasional tree sprouting from the ruins, although the two-storey building still standing is something else entirely. From Preah Khan it’s only a short ride to the great wide moat that surrounds the ancient city of Angkor Thom. Once the capital of the Khmer Empire before its fall, Angkor Thom is home to several striking temples and other assorted ruins. Just crossing into Angkor Thom across the four bridges, each lined with sculptures of gods and demons and passing under the giant face on each gate is an experience worth having. Bayon: The main temple of Angkor Thom built by King Jayavarman VII, Bayon sits dead center in the ancient city. On the upper terrace, you’ll spot the “face towers”, which has giant faces on some or all of each tower’s sides. 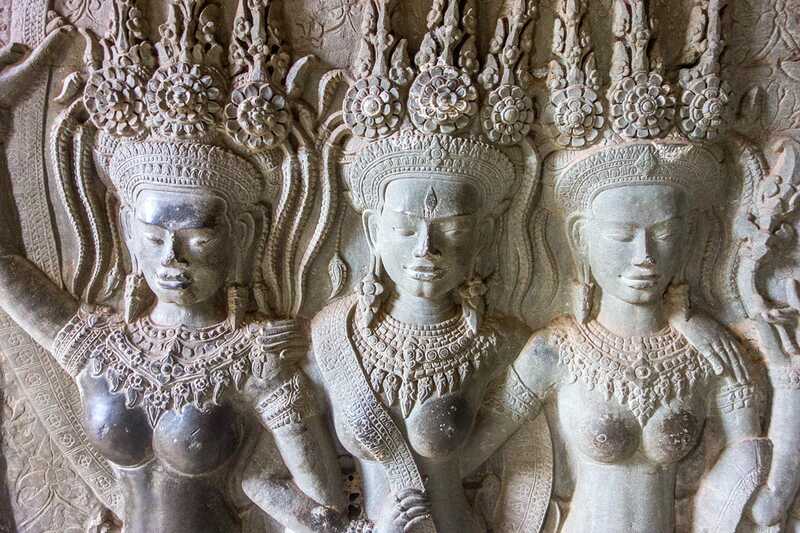 Throughout the outer galleries are scenes and stories from Khmer times carved into the walls. Baphuon: A temple mountain of three terraces, Baphuon makes an impression right off the bat with its long elevated bridge which passes reflecting pools. This Hindu temple to the god Shiva underwent some problems during restoration but standing at its top you can see the efforts were well worth it. Terrace of the Elephants: In what might look like an ordinary field you’ll find a long terrace platform. Stretching 350 meters, this ornately carved platform with elephant statues at either end, was used in ceremonies and to watch army parades. Terrace of Leper King: Just up the road from the Terrace of the Elephants, this terrace manages to be noticeably different than its neighbor. With a shrine on top of the square-ish platform to the Hindu god Yama, the sides of this platform also feature beautiful carvings. 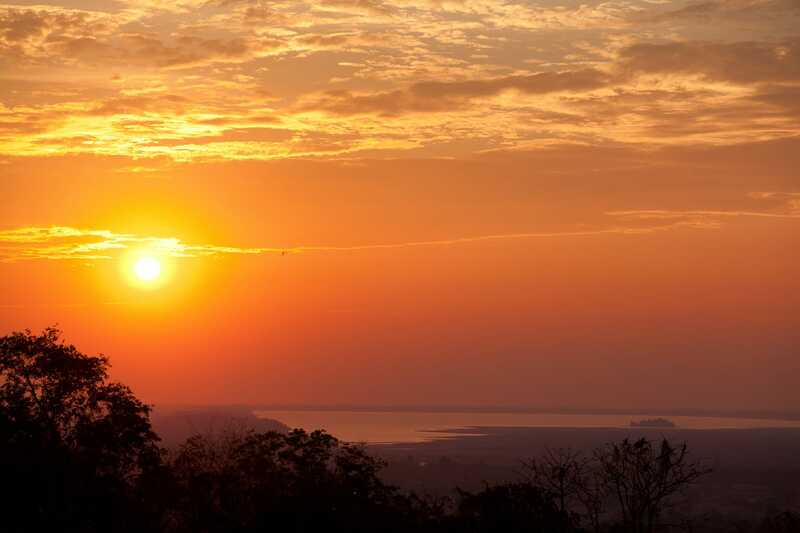 There’s no better place to finish out the day and watch the sunset than from the Phnom Bakheng temple mountain. From the top of this Hindu temple to Shiva just south of Angkor Thom you can admire the colors of the sky and see Angkor Wat change with them. Fair warning, as one of the most popular sunset spots it can get busy. 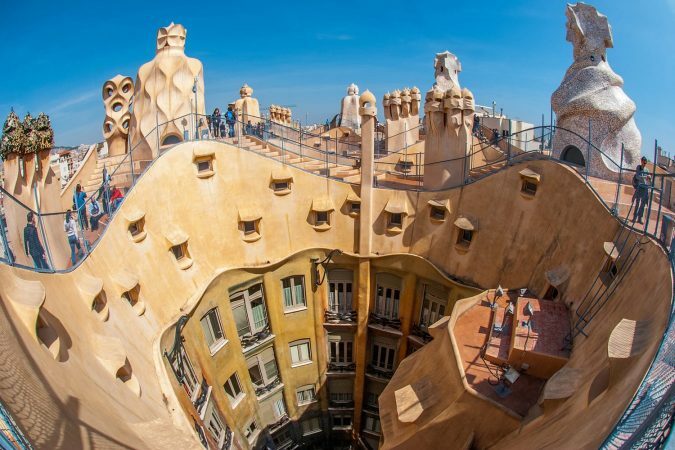 You probably won’t care though once you see the vista from this viewpoint 60 meters from the ground. It’s not a bad way to finish the day. 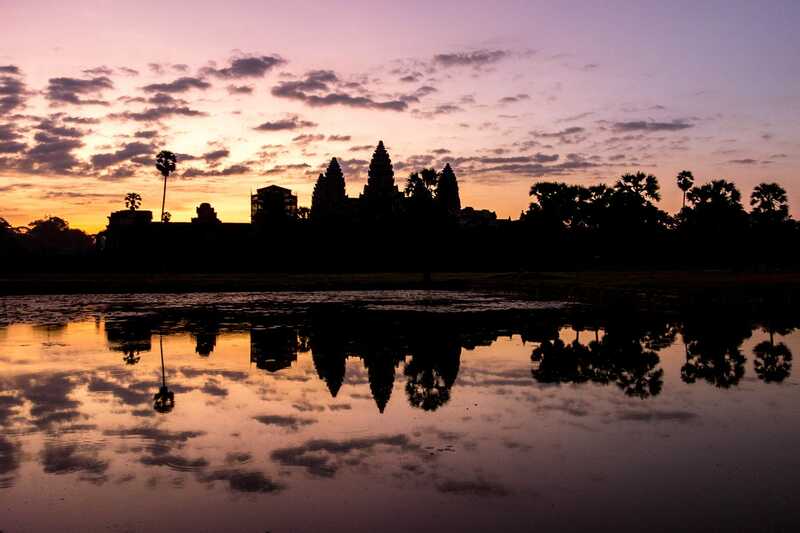 Those are the tips for visiting Angkor Wat from sunrise to sunset. 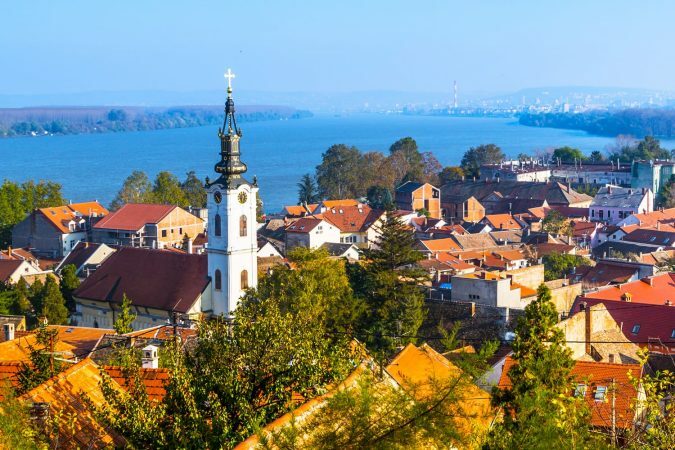 Following this itinerary is a fantastic way to spend a day experiencing this incredible place of heritage, history, and beauty.